After some time spent last week taking proper photographs for a very funky furniture firm, I took myself off to a place where I could take photographs more for my own entertainment. Of course, every Somerset-based photographer HAS to take pics of this place. Indeed, I have photographed it before, but only from a distance, as a thing floating above the landscape like an old galleon drifting over the misty flatlands of the Somerset Levels. And that is perhaps not an inappropriate metaphor, as in medieval times the Tor was an island surrounded by water that stretched inward from the Bristol Channel. But this was the first time I had made the lung-challenging climb up the steep slope to see, close at hand, the structure that tops the Tor and completes the mysterious silhouette I had photographed from distance: the remains of St Michael’s Church. The tower is all that is left of this 14th-century place of worship; the rest of it having been demolished during the Dissolution of the Monasteries. The Tor is well known as somewhere to come for a spiritual blast of some sort. On the day, however, the blast most evident was from the wind, which was frighteningly powerful; so much so in fact that there was a real sense of fear that one might be blown over. Many people dived into the base of the tower or hunkered down onto the grass for protection. The tower has to be one of the most photographed places in the land, and naturally, I took scores of photographs too. Given the zillions of shots that must already exist, I doubt I have produced something profoundly original, but I have given it a bit of post-production work to try and capture some of the mood of the place and I hope you enjoy looking at it. 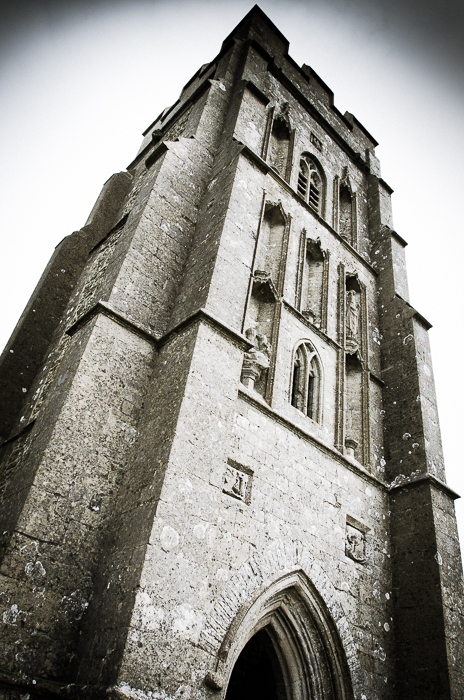 St Michael's Church Tower, Glastonbury Tor. Photographer Somerset.